Jun 16 - Sep 19, 2013 — Kiesendahl + Calhoun Fine Art, Ltd.
Jan Tyneic and Stephen Geldman are two local artists connected to the same place and river. They reside in Hawley, not far from the Lodge. Jan lives part of the year in Bali, a place which inspires his stunning photographs. This show features Jan's Bonsai series, complex, gnarled trees that draw the observer into many-layered dimensions. 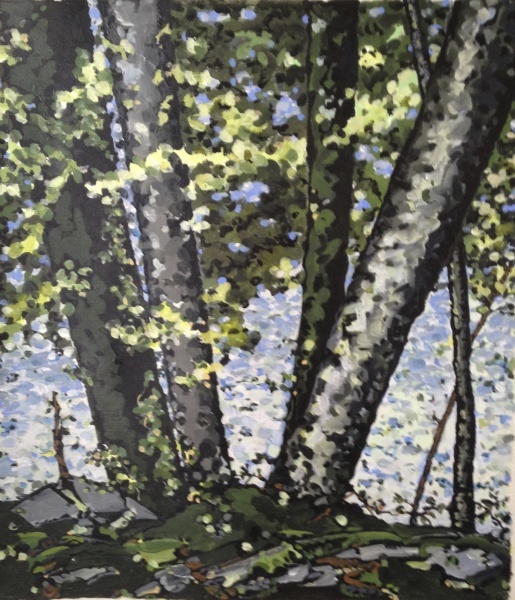 On the opposite wall, Stephen Geldman's paintings scintillate with the light and color of the landscape surrounding the Lackawaxen river which passes by his home. Stephen also lives and works in New York City.